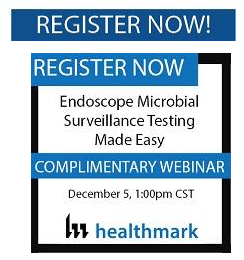 Healthmark Industries is hosting a complimentary Webinar on December 5, 2016 to review Endoscope Microbial Surveillance Testing. Register online today! The featured speakers, Mary Ann Drosnock, MS, CIC, CFER, FAPIC, RM(NRCM) and Alpa Patel are experts in the realm of microbiology and the current standards for endoscope reprocessing.